During the past few years eCommerce has drastically impacted the way B2B (business to business) businesses operate. 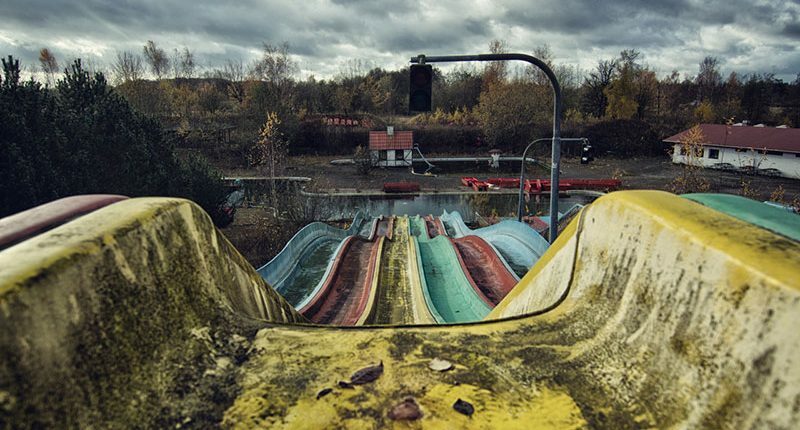 The once familiar landscape of customer acquisition, customer retention, sales, service, support and order fulfillment has been permanently altered. In our experience gleaned from more than a decade of designing and developing B2B eCommerce websites across various industries I’ve compiled a list of 5 common obstacles to B2B eCommerce success. B2B (business to business) and B2C (business to consumer) eCommerce projects can be different animals altogether. More often than not with B2B eCommerce you’ll need a much more customized shopping, checkout, and customer relationship management experience on the site at minimal. If you’re like many B2B clients we service you’ll likely even require more advanced eCommerce capabilities such as price quote request features and/or purchase order management along with the ability to assign custom pricing rules based on the discount you assign to specific customer groups. Custom features like “percent off discounts” based on volume purchases would also fall into this customization requirement as those sort of features can be quite common for B2B eCommerce sites. In fact if you want to truly set your B2B eCommerce site up for success you’re going to want to customize it based off of your own unique business model while at the same time simplifying the user experience. At Georgia Web Development we’ve been successfully developing and designing B2B eCommerce websites for more than a decade now. Do your homework when choosing your B2B eCommerce developer or agency. Do they have a portfolio on their own website that you can view and one that links to active and working B2B eCommerce sites that they’ve developed, designed and launched for their clients? They shouldn’t hesitate to provide you with references upon request of previous and existing clients as well. Seldom does a complex B2B eComerce project not require close collaboration and partnership with other software vendors and related agencies but if quality and communication is important for your project (it should be) you may want to insure that the work isn’t being outsourced overseas. 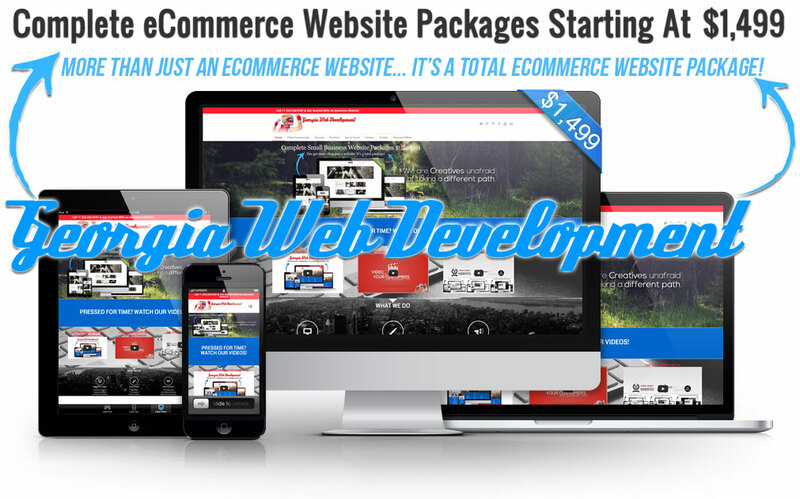 At Georgia Web Development we take great pride in keeping all of our eCommerce development and design work in-house in the USA. You can’t afford to ignore the integration needs of your B2B eCommerce website. While your eCommerce shop typically only accounts for the front-end needs of your businesses there’s more that happens after an order is placed right? Sure there is! Manually entering data is time consuming, error prone, and simply isn’t scalable. Your eCommerce site should integrate seamlessly with your other business systems like accounting, shipping, and marketing to automate the syncing of information like customers, inventory, pricing, and shipping between systems. From QuickBooks and other accounting software to UPS, FEDex, USPS and other commonly used business software, Georgia Web Development can integrate your business systems directly into your B2B eCommerce system. This insures the minimal of manual entry processes that would need to be completed outside of your B2B eCommerce website. Efficiency while maintaining accuracy is the goal of any well developed and well designed eCommerce system. Yours should not be any different. Bad B2B eCommerce stores are plentiful on the web today. From poor user experience, slow site speed, to horrible viewing and usage on mobile devices. With consumer expectations influenced by the more modern B2C eCommerce shops, the traditional B2B eCommerce stores should take heed. At minimal your B2B eCommerce shop should offer similar, if not better, experience as any B2C eCommerce website out there. This includes features like custom pricing, product recommendations, order history display, and ease of reordering based on past purchases etc. Content is king when it comes to eCommerce. To do well with your B2B eCommerce website I can’t encourage you enough to go above and beyond the traditional text and basic image content. Just like B2C the B2B eCommerce marketplace is extremely competitive. You’ll want to make sure you capitalize with great content. This includes relevant articles and educational resources, excellent product descriptions, images and meta information. This means taking the time to either write great content and product descriptions yourself or being prepared to pay for a professional to help you with all of that. Either way it’s a critical piece of the whole B2B eCommerce equation and you can’t afford not to do well with your content. 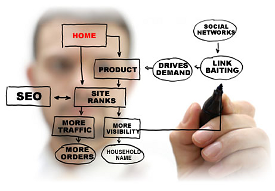 SEO will be one of the most critical aspects of your B2B eCommerce website. Contrary to what most SEO experts would like you to believe, great SEO is not rocket science nor is it shrouded in mystery. It is indeed work, purposeful educated work at that. But you need not spend a ton of money nor should you necessarily need to go hire a so-called SEO expert to have it done right. Any experienced eCommerce website developer or designer worth their weight in salt will set your site up for success at the outset. Once you’re set up correctly following SEO best practices across the site you most certainly can continue to work on developing and/or refining the SEO even more. Great basic SEO involves using both accurate and good keywords in your landing and product pages, accurate and descriptive page titles, appropriate use of HTML tags, including Meta content, using alt attribute for images, and obviously a bit more. Write your content for the humans that will be using your site and not the SEO robots. I can’t emphasize this point enough. Simply use the form on the bottom of this page to send us your B2B eCommerce website questions or request a FREE eCommerce project proposal. You can even include a phone number (optional) and we’ll call you. In regards to projecting the costs associated with your B2B eCommerce website be sure to check out my eCommerce costs guide. Although it’s geared more towards B2C eCommerce many of the same principles and pointers will still apply to your project as well. At Georgia Web Development we know first hand the many challenges and decisions that you’ll face along the way to establishing a successful B2B eCommerce presence on the web. From choosing the right eCommerce website hosting provider to deciding on the best eCommerce platform we’re here to offer our free expert advice and eCommerce industry knowledge without any fancy sales pitches thrown in (we promise). Best wishes on your B2B eCommerce venture! – Mark D. Hulett is Senior eCommerce Website Developer and Designer at Georgia Web Development. His experience and working knowledge of B2B eCommerce websites spans more than a decade. Website Maintenance… It’s really NOT an option. I’ve developed, designed, and built a lot of websites since I first started back in 2009. Lots of things have changed on the web since then but one thing that hasn’t changed is the need for regular site updates and maintenance. WordPress, WooCommerce, Magneto, and even static HTML and CSS sites will all require routine updates and maintenance. Typically at the outset of a new website project when you’re calculating the total cost of your website you’ll have allocated a budget for ongoing maintenance and support. As the web evolves so do security vulnerabilities and bugs in the code. Not keeping your website or eCommerce shop well maintained and up to date is a recipe for disaster. It may be working fine today but if you’re not running updates and keeping things neat and tidy on the back-end… the clock of brokenness is ticking my friend. Most CMS (Content Management Systems) like WordPress and Magento routinely roll out updates to their software. While these updates (when applied correctly) usually go off without a hitch… sometimes they don’t. I can’t count the times personally I have wound up with a broken website after applying a seemingly simple and straightforward update. Fortunately for me web is what I do and being a code guy I can very quickly pinpoint the issue and fix it. If it’s something that’s going to take some time to resolve I can always revert to my backup and keep my website or my client’s website online until the issue is resolved. For the sake of brevity let me just emphasize that routine website maintenance and updates are critical to the health and success of your website or online shop. If your not necessarily a little tech savvy or somewhat familiar with WordPress, Magneto, WooCommerce, or even plain HTML these routine updates and maintenance tasks can seem a bit daunting. Not to mention the surprise you may have found yourself in if (like many) you didn’t initially figure in things like ongoing maintenance and support when researching the long-term costs of your eCommerce shop. We just launched what I assert is the most reliable and economical WordPress Website Support + Maintenance Package, Magento eCommerce Shop Support + Maintenance Package and WooCommerce Shop Support + Maintenance Package available anywhere. Wouldn’t it be reassuring to know you have a professional website developer on tap should something go horribly wrong when you click that “update button”? Maybe like the vast majority of website owners you simply and honestly just don’t have the time nor tech skills to keep your website or eCommerce shop updated and maintained? Is Your Website Being Neglected? What if you discovered that you could easily afford a website developer to do all the heavy lifting for you? The only thing then you’d need to focus on would be growing your business and you could then leave the mundane website updates and maintenance tasks to an expert. Sure you could still manage your website and add content anyway you deem fit but you’d rest assured knowing that everything’s running smoothly under the hood so to speak. Reliable and professional website maintenance and support for your website or online shop may not be as expensive as you think. It can however prove to be very expensive to not have it in place should disaster strike. The WordPress Website Maintenance + Support Package and WooCommerce Shop Maintenance and Support Package I began offering my own web clients early on is in my honest opinion (and many other’s) the best value in the industry right now. Both are robust base packages that also allow additional design/development hours to be purchased when needed at a fraction of what most agencies now bill hourly for WordPress and WooCommerce web development and web design. Very soon we’ll be introducing our big boy, “The Magneto eCommerce Maintenance & Support Package“. We’re going to put more than a decade of Magento development and design experience up for grabs and shake up the Magento work-space somewhat with a very reasonably priced package. It’ll be a plan that the average entrepreneur can easily afford. Want to discuss your website update and maintenance needs with a professional? Use the simple form below and lets get the conversation started. – Mark D. Hulett is an accomplished website developer and website designer at Georgia Web Development. His experience and working knowledge of website development & website design spans more than a decade. As a small business entrepreneur since age 21, a single dad of three young boys, and a typically wide-open website designer and web developer I’ve learned firsthand that the skill of focusing is critical when it comes to being both productive and successful. Often overlooked and more frequently downplayed by popular corporate culture, focus is the trump card in any successful entrepreneur’s playing hand. Although it’s more often than not devalued by the widely popular multitask productivity myth, focus is in fact the real and legitimate parent of accomplishment. Why is focus such an important factor to getting work and other tasks accomplished? Obviously if you’re having issues with focus, then you’re not going to be very productive or creative. If focus isn’t present your likely not getting much productive work done anyways. Your creative juices begin to dry up and you become stuck in a productivity rut or even worse you’re regressing and falling further and further behind with important tasks at hand. Despite what the ever popular corporate culture wants us to believe, we as human beings are not wired up for multitasking. Multitasking indeed has it’s place but it’s not at the forefront of exemplary productivity and creativity. Performance wise we are at our peak when we’re focused. When we’re really focused and we’re leveraging our skills, creativity, and talents in a process that is challenging it becomes fertile ground for operating in a peak performance state known as “flow” or “being in the zone”. We all can relate to the feeling of having your skill set completely match the challenge at hand to the point that you lose yourself in what you are doing. It’s akin to a relaxed state of complete concentration and absorption where you become ‘one’ with the task at hand – your sense of time is diminished or even nonexistent, any sense of nervousness or anxiety completely diminishes and trivial thoughts not related to the task at hand evaporate on the spot. So… how do you actually get and even more importantly stay focused? What are some practical ways to get this abstract notion of “flow” or “being in the zone” to show up in your life? Here are a few simple pointers that you can begin implementing immediately. The key to nurturing focus and becoming more productive has everything to do with eliminating or at least minimizing distractions. Ask yourself what are your distractions? What keeps you from being focused? Take just a few minutes and with pen and paper jot down five of your major distractions. What are five things that are keeping you distracted in whatever area of life you want to achieve more focus in? What’s distracting you at work? Is it a troublesome client who makes it a habit of consistently dropping by your office unexpectedly and without appointment? Is it a friend or significant other who calls or texts and disturbs you every ten minutes? Is it a barrage of emails? Is it your Facebook notifications that keep pinging you on the hour? You need to get very clear and honest with yourself about what’s really distracting you. I’ll venture to bet that once you get your distractions identified on paper, that what you’ll find is that one of the biggest culprits to your ability to focus is multitasking. You’re attempting to do multiple things at once. All of your distractions are the antithesis of focus. When you’re attempting to do several things at once, you are by definition not focused. You are dividing your focus and attention. When you divide or diffuse your attention, it’s the exact opposite of the phenomenon that makes a laser work so well. A laser differs from other sources of light in that it emits light coherently. This phenomenon known as “Spatial Coherence” allows a laser to be focused to a tight spot, enabling applications such as laser cutting and lithography. Spatial coherence also allows a laser beam to stay narrow over great distances (collimation), enabling applications such as laser pointers. Many principles that underlie phenomenon are applicable when applied to different scenarios and contexts. Likewise this same principle applies when it comes to our attention. When it’s scattered and not focused it becomes much less effective. If you want success in your career, your business, a relationship or essentially in any endeavor, you should put your focused attention on it. Your undivided attention has to be focused on whatever it is you’re doing if you expect anything worthwhile to come from your efforts. You can’t do that effectively if you’re always trying to multitask. Make no mistake about it multitasking and the “being busy feeling” that it often engenders in us is just that… a feeling. It’s a productivity illusion if there ever was one. Feeling busy is by no means a good indicator of actual productivity. For further proof of this fallacy in assumption just look back at your greatest achievements and creative moments. I’ll bet when you analyse them honestly you’ll discover it’s the exact opposite. You didn’t feel busy at all. More than likely you were in flow. You were relaxed. You were in the zone and even the concept of “being busy” would have been foreign to your thought stream. You may have appeared busy to an onlooker but on the inside you were actually effortlessly dancing on the cusps of grace. Make no mistake about it multitasking and the “being busy feeling” that it often engenders in us is just that… a feeling. It’s a productivity illusion if there ever was one. To work in Block Time you’ve got to basically set off sixty to ninety minute blocks throughout your day. These are blocks where you sit down and work on a single task and you do nothing else. You don’t let yourself get distracted by anything. You don’t let yourself get up and do other things. You focus on that one task at hand. You stop attempting to do multiple tasks at the same time. It’s a very simple yet powerful concept. Regular breaks are conducive to greater productivity and concentration. When implementing working in Block Time, schedule regular breaks in between activities. For example, focus intensely for 2 hours on a specific task, take a 10- or 15-minute break and work for another 2-hour block of time. Don’t just take my word for it. Experiment with using Block Time yourself and watch both your productivity and creativity skyrocket. You’ll want to limit activities that interfere with your Block Time goals. Eliminate unproductive, time-consuming activities. During the block of time allotted to working, avoid unnecessary web and social media browsing, television watching, or texting. Devote your undivided attention to the high priority task at hand. You’ll also want to avoid checking email or answering the phone (unless it’s the specific task assigned for your Block Time). Focus your full attention only on the task that you blocked off the time to work on. Your calls can go to voice mail. The emails can wait. The 5th Selfie your friend posted this week on Facebook can wait. You can let others know that you will be unavailable during this time. If you’re working at home, explain your strategy to your family so they won’t likely interrupt you. If you’re in an office setting, limit interruptions from co-workers or supervisors as best you can. When you begin to work in this way and you’re super focused what you’re going to discover is that you get somewhat exhausted after each time block. You’ve actually put a tremendous amount of mental energy into the task you were working on. It’s imperative to give yourself a little bit of a break after each block. Ten to fifteen minutes minimum should be sufficient for most. That’s where you can go get a snack, grab a coffee, chat with your friends, take a walk outside, or even log onto Facebook and begrudgingly LIKE that 5th Selfie your friend just posted. Fifteen minutes or so later, you’ll return and start on your next Block Time task. Be careful not to make the blocks too long either. If they are too long you’re going to get exhausted and this will actually end up being counterproductive. Sixty to ninety minute Block Times will be ideal for most. Basically you’ll have your day broken into these Block Times so that you’re focusing on one single task at a time. As you develop a discipline for working in Block Time what you’ll find is that you’re really preventing yourself from unconsciously multitasking. You’ll be getting tasks completed much more efficiently and your creativity will be enthused with a new energy. People usually think their work and productivity are tied to the amount of time they put in. That assumption is not entirely true. In reality productivity is more related to focus and the quality of the energy you’re putting into the task at hand. Who among us can’t identify with a task that should take 30 minutes actually taking hours to complete? Usually this happens when we’re doing many different things (multitasking) simultaneously while trying to complete a single important task. Numerous scientific studies have shown that it can take upwards of 10 to 15 minutes to get your attention back on track after being distracted. This becomes even more of an issue if you’re doing creative or highly technical types of work. Those 10 to 15 minutes it will take you to get back into flow is time that is irretrievably lost. Lately, I’ve been working on implementing the use of Block Time in managing my own web development company and the results of doing so are nothing less than amazing. At first it definitely felt counter-intuitive for me. Like so many among us I had unconsciously subscribed to the popular corporate culture which touts multitasking as a great asset. If you were good at multitasking it meant that you were not only flexible but valuable as an employee. In all honesty what they should have actually told us was that they were happy that we were willing to do more for less and that it was both convenient and profitable to have someone willing to routinely take on tasks outside of the job description. I typically have as many as 7-10 different active web projects going on at any one given time. The natural inclination is to bounce back and forth on the different projects all throughout the course of a work day. I actually worked like this for years not knowing there was a better way. What I’ve discovered is that by assigning Block Time for each project during the course of my work day I tend to not only be more productive but the creativity that’s essential in my field is never lacking. Give the Block Time practice a shot. I think you’ll find that you’re going to be not only more focused but in “the zone” a lot more often. Your productivity will improve tremendously and perhaps even more importantly you’ll feel a lot happier and less stressed. 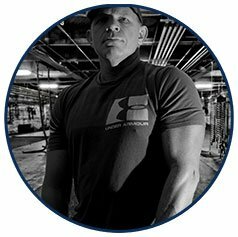 – Mark D. Hulett is a life long small business entrepreneur, website developer and website designer at Georgia Web Development. His experience and working knowledge of small business website development & website design spans more than a decade. 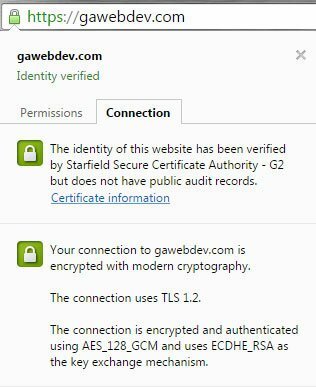 Back in 2015 on our Georgia Web Development Website we made the switch to full site-wide SSL by default. We even took it a step further and implemented what is known as “Force SSL”. Force SSL utilizes code that automatically redirects all non-secure HTTP requests to the respective secure HTTPS URL. Like it’s name implies, force SSL forces all browser communication with the website to occur over a secure, encrypted connection. While there are a number of ways to implement Forced SSL on entire websites or even single pages we won’t be going into those options here. Instead I’ll stick with the title of the article and attempt to make the case for why moving to HTTPS site-wide by default not only makes sense but should be the new standard for both webmasters and website owners in 2017. Back in early 2015 Georgia Web Development began implementing site-wide SSL with all of our new eCommerce Starter Package Websites that we developed, designed and launched for our clients. Obviously we were already implementing SSL on cart, checkout, and forms submissions but it made sense to finally adopt and embrace the site-wide SSL by default approach. We went a step further no long after that and very soon began making site-wide SSL the default for all of our new Starter Basic Website Packages as well moving forward. We’re thoroughly convinced through our own experience, testing, and working knowledge of deploying Site-Wide SSL that it’s benefits far outweigh any arguments against using it. SSL/HTTPS – What Is It? The infamous “Green Padlock” denotes a valid SSL connection using encryption. SSL (Secure Sockets Layer) is the standard security technology for establishing an encrypted link between a web server and a browser. This secure link ensures that all data that passes between the web server and browser remains private and integral. Usually when data is transmitted between browsers and web servers (HTTP) it’s done using plain text. This transmission in plain text leaves the connection open and vulnerable to what is known as eavesdropping. If an attacker or eavesdropper is able to intercept the data being sent between a browser and a web server that’s using plain text transmission then the information can been seen and used. The Server then responds by transmitting to the the browser it’s public key and a server certificate. The client’s browser and server then negotiate the level of encryption to use for the secure communications. The client’s browser encrypts a session key with the server’s public key and then sends the encrypted data back to the server. The Server then decrypts the message sent by the client’s browser using its private key, and a secure session is established. Both the client and the server use the session key to encrypt and decrypt the transmitted data. On June 25th, 2014 at Google I/O 2014, Google’s Pierre Far and Ilya Grigorik made their presentation calling for HTTPS Everywhere. In summary they reminded all of us that data delivered over an unencrypted channel is insecure, untrustworthy, and is easily intercepted. They also reminded webmasters and website owners of the importance of protecting the security, privacy, and integrity of user data. Google I/O is an annual software developer-focused conference held by Google in San Francisco, California. Google I/O features highly technical, in-depth sessions focused on building web, mobile, and enterprise applications with Google and open web technologies such as Android, Chrome, Chrome OS, Google APIs, Google Web Toolkit, App Engine, and more. 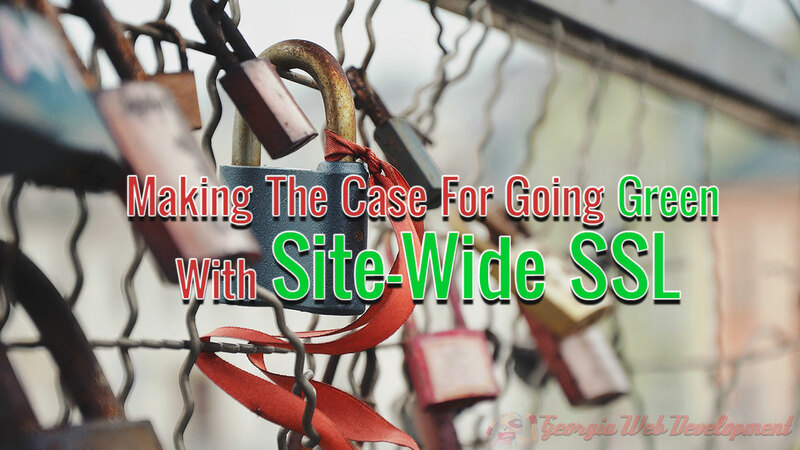 While much more can be and has been written about the benefits of implementing Site-Wide SSL hopefully this short article scratches the surface a bit and helps to make the case for going green with Site-Wide SSL the new default for webmasters and website owners. Simply use the form on the bottom of this page to send us your SSL or HTTPS related questions. From help choosing the right type of SSL Certificate for your website to helping you properly 301 redirect to your new SSL pages we’re here to offer our free expert advice without any fancy sales pitches thrown in (we promise). 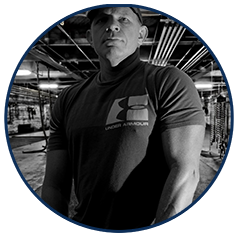 – Mark D. Hulett is an accomplished website developer and website designer at Georgia Web Development. His experience and working knowledge of small business website development & website design spans more than a decade. March 18th, 2015 is National Ag Day. We’d like to not only recognize the abundance provided by American agriculture but make mention of the significant role that modern web has and continues to play in the agricultural industry. A farmer in the field with tablet in hand is no longer a strange sight these days and a fourth generation Georgia Pecan Farm with a bustling eCommerce website is a definite sign of the times. We’ve been tasked in the past few months with building a few agriculture industry based websites. It’s a great feeling and an honor bringing the best website technology to the Ag industry. We believe we’re helping farmers, consumers, and Ag industry manufacturers bridge the communication gap with modern websites and web technology. It’s from this experience that we can now say with certainty, agriculture and websites are no longer an odd couple. National Ag day is the day for producers, agricultural associations, corporations, universities, government agencies and countless others across America gather to recognize and celebrate the abundance provided by American agriculture. As the world population soars, there is even greater demand for the food, fiber and renewable resources produced in the United States. A few generations ago, most Americans were directly involved in or had relatives or friends involved in agricultural-related endeavors. Today, that is no longer the case. It’s important that we join together at the community level. Voices, in concert, become a shout that carries the message a great deal further than any one of us can do alone. There are over seven billion people in the world today. That’s over seven billion mouths to feed every day. Show your appreciation for the individuals that make this feat possible on Ag Day. Raised on a Georgia farm & later transplanted into tech Mark D. Hulett is an accomplished website developer and website designer at Georgia Web Development. His experience and working knowledge of website development & website design spans more than a decade. Using social media (YouTube, Facebook, Google Plus, Twitter, Pinterest) is obviously a great way to connect with and engage your customers. The overall success of your small business social media strategy depends largely on how and what you communicate. The most common mistake many small business owners make with their social media is using it to talk exclusively about their business, services, or products. By using the pushy social media salesman tactic you’re simply applying an outdated, one-way communication model to a new medium. Effectively using social media is all about engaging your audience. Your primary dialogue on social media should be about and include your customers. You’ll need to utilize creative and unique ways of engaging your followers and fans on your social media channels and your website. The rules for building an effective social media presence are similar to those for building a website audience. You’ll want to add new content/posts regularly. Your content should be unique, relevant, personable, and provide insights and comments on topics that appeal to your customers’ interests. While you don’t want to excessively mention your products and services, it’s perfectly acceptable to reference them in moderation. It’s even better if you can link your products and services into a genuine story about your customer(s). Communicate your brand’s vision and personality in a way that reinforces existing brand affinity and you’ll attract new customers with whom your brand resonates. Using a system like the one mentioned above will help you measure how effective your social media marketing really is. You can then modify your tactics appropriately based on how your shares are being received by your community of followers. At Georgia Web Development we’ve spent years helping small businesses establish, maintain, and grow a powerful social media presence on the web. Follow these tips and you’ll be off to a great start in your small business social media journey. Mobile eCommerce or Mobile Commerce is growing rapidly. As of March 2015, studies now indicate that about 29% of mobile users have made a purchase with their smartphones. Mobile eCommerce retail sales are expected to top $67 billion in 2015. The trend presents significant challenges and opportunities for retailers, who are now tasked with optimizing their sites for mobile and finding new ways to reach and engage customers on their mobile smartphones and tablets. Engage mobile device shoppers by insuring your eCommerce website is optimized for a variety of mobile devices. As a first step in engaging mobile customers, make sure your store site is optimized for a variety of mobile devices. Make a priority to continually re-evaluate your end-to-end mobile device shopping experience to accommodate your eCommerce sites’ visitors ever changing needs and behaviors. Are your mobile device interface (menus & buttons) intuitive? Are images and pull-down menus re-sizing correctly? Is your mobile device search function easy to find and use? Are ratings and reviews displaying prominently on mobile devices? Is your Checkout optimized for mobile devices? Are mobile device customers easily able to share products and purchases on their social networks? Insuring that your eCommerce website is optimized for all devices including PC, smartphones, and tablets is a must. If you’re planning on launching your first online eCommerce website or you are updating your existing eCommerce website to optimize it for mobile devices we offer unparalleled assistance in approaching your eCommerce project. So you want your website to be number one on Google? At minimal you’d like your website showing up on page one of the top search queries for your niche or industry. Right? Who wouldn’t want this? Well I’m about to rock the boat here a bit by advising that you don’t spend money on aggressive search engine optimization (SEO). Yeah, I know that advice sounds crazy. Just hang in there throughout this article and I’ll bet that the suggestion makes a lot more sense when you’ve given all of this a full read-through with an open mind. The problem nowadays is that website owners or site managers typically view search engine optimization as the answer to their website ranking woes. The reality however is that their situation is much more complex than that. As a matter of fact it’s considerably more complex. The hard, cold, truth is that the best people to improve your search engine rankings are closer at hand than you might think. It’s you! It’s you and your organization’s internal team (if you have employees). The solution can’t be found in hiring an SEO company to boost your website rankings for Google and other search engines. Time, consistency, and commitment are the allies of great search engine optimization. It’s going to take time and an unwavering commitment on your part. You’re going to have to commit to owning and fixing the real issues that keep your website from ranking well in the search results for your niche or industry terms. SEO is not the shrouded mystery that some in the SEO community would like you and I to believe. SEO – A Sleazy Little 3 letter Word? The crux of the issue seems to start with the term itself “search engine optimization”. So many half-truths and misconceptions surround it. SEO is not the shrouded mystery that some in the SEO community would like you and I to believe. Search Engine Optimization jargon and terms like “keyword density” and “back-link strategy” leave most of us feeling that SEO is a feat only to be undertaken by the experts. Adding to the confusion is the contradicting fact that many complex SEO techniques do in fact work to some extent. Despite Google’s improved search algorithms and it’s ongoing efforts to crack down on SEO manipulation it’s still within the realm of possibility to improve placement through system manipulation. While those successes won’t stick around and it’s harder, it’s still not impossible. Most of the tactics touted by SEO’s can only have short term benefits. They simply won’t last without renewed financial investment. Why won’t they last? Simply stated it’s because the entire objective and premise behind it is innately flawed. Good SEO can’t and should never be solely focused on getting to the top of search engine results for particular phrases or “key words”. Realistically you shouldn’t even be optimizing your website for search engines at all. Cover the basics, sure. However if you really want to optimize your website then optimize it for people. Optimize your website for your visitors first and foremost. If you want to invest into something worthwhile and lasting it should be into creating unique and relevant content for your site’s visitors. That may sound a bit too cliche’ but that’s the real truth about good SEO. It’s a well know fact that Google’s primary objective when returning search results is to consistently return the most relevant and quality laden content based on the search query. Don’t make the critical mistake of placing more emphasis on ranking than what you place on providing unique, relevant, high quality content for site visitors. Once you make that mistake you might as well go ahead and get ready for a never-ending, uphill struggle with your site’s SEO. Your primary objective should always be better content, not higher rankings. You should also note that when you hire an SEO company or individual to improve your placement in the rankings that by virtue of doing so you’re actually not in alignment with what Google and other major search engines are always working diligently to achieve. That is to deliver relevant and high quality search results for it’s users. Your primary objective should always be better content, not higher rankings. SEO companies can use every trick in the book to get your website better rankings in the short term. However long term they will always fall short. Why? Simply because Google’s algorithms are constantly evolving and updating. It’s not just Google either. Most search engines are getting better and better at returning relevant, quality content based on the query. In summary the goal is to create and present useful, unique content for your website’s visitors. Taking a high road SEO approach with your website’s search engine optimization is more about doing the right things, doing them well, and doing them with consistency over a period of time. Get Started With a FREE Website Project Consultation! Prospects will inevitably visit your website when making the critical decision to take that next step. Your website is your most important marketing asset. It’s your golden opportunity to effectively communicate your brand and positively influence those all too critical first impressions. Making that first visit to your website work in your favor is critical. It’s not just about the website looking great either. While having an aesthetically appealing design is great your website should also rank well on the website engagement scale. Whether it’s improving brand awareness, establishing credibility or simply generating leads, your website and it’s content will make a lasting impression. How To Know When It’s Time For a Website Redesign? Technology and the web is always evolving. So how do you know when it’s time for a website change? Consider the following tips as pointers for knowing when it’s time to redesign or redevelop your website. Along with the pointers listed in this article there are many other great resources to help you successfully plan the redesign of your website. Above all else do your research and don’t forget to set goals for the website redesign project. Get Started With a FREE Website Design Consultation! https://gawebdev.com/georgia-web-development/wp-content/uploads/2015/02/time4change.jpg 1054 1577 markdh1 https://gawebdev.com/georgia-web-development/wp-content/uploads/2017/05/gawebdevlogo.png markdh12015-02-05 09:55:452019-02-16 17:57:16Website Redesign Tips. Is it Time For A New Website? The Small Business Website Starter Package is the perfect website solution for individuals or small businesses looking to establish a solid online presence at a great price. Don’t let the term “Website Starter Package” fool you either. It’s a fully complete, robust website solution in and of itself. 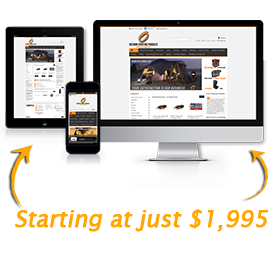 You won’t find a more powerful or effective website solution at this caliber for a lesser price. 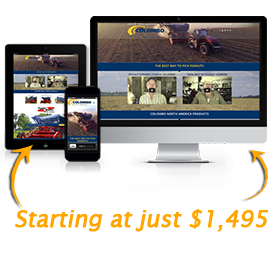 This identical website package is one that we would typically retail at the range of $1,000-$1,500 minimal. Every January (New Year) we like to make one website introductory offer that’s truly amazing. This 30% off Small Business Website Starter Package deal is that amazing offer. Our 7 Step Website Design & Website Development process all starts with your dream and passion. You tell us what you envision for your new website via the initial phone consultation. You’ll be able to monitor your website along the way with 24/7 access to the developing website and full access to your personal website designer. You will be able to review designs, send files as well as provide feedback and direction. Your Small Business Website Starter Package includes everything you need to successfully launch and keep your website online. Fast Turn-Around Times Averaging 4 weeks or less! 1 Year Included – Blazing-Fast servers powered by 12 Intel® Xeon i7 core processors (hyper-threaded into 24 cores) DDR3 memory for low latency with 2 SSD Drives as well as 5 spin drives. The best page load times and solid-state reliability in the industry. 99.9% up-time guarantee. cPanel® Unlimited storage and bandwidth. Scalability to fit your needs. 24/7 secure monitoring. 50 GB disk space & 1,000 GB bandwidth. (1) 12 Month Free registration included. yourwebsitename.com Choose any available domain name and we’ll handle the rest. 1 Year SSL Certificate Included – protect private information, passwords submitted to your website. Visitors browse with confidence, knowing the information they enter on any secured page is protected. An SSL (HTTPS) will also help boost your search rankings on Google. 1 Year Dedicated Hosting IP included giving your hosting account and website a unique IP address, one that’s not shared by any other accounts on the same server. So if you need direct access to your site, even when your DNS records are being propagated, or are planning to add an SSL Certificate, a Dedicated Hosting IP is essential. 5 Pages – example: Home, About Us, Contact Us, Portfolio, Blog. (You can always add unlimited pages on your own or we’ll be happy to quote you for page additions.) You’ll get a professionally designed layout and custom branded graphics for the pages that are created exclusively for your website. You’ll have 1,000’s of stock images to choose from or submit your own images and we’ll do our design magic in Photoshop to render them ready for your website. 1-on-1 telephone consultations and access to your professional website designer. From server & email set-up to coding we do everything. There’s no need to worry your pretty little head over html code or complex web tasks. You can focus on your business while letting us do what we do best. 1-on-1 telephone consultations and access to your professional website developer. Get Your Georgia Small Business Listed Online For FREE In Our 2012 Georgia Small Business Directory! How Much Do eCommerce Websites Cost in 2018? How Much Do Websites Cost in 2019? What’s Included In The Basic Package?